Description: Twelve years after Fisher-Price discontinued the #758 Pony Chime, they decided to introduce an updated version of the same idea. The new #137 Pony Chime has two brightly colored circus ponies that bob up and down and pull a chime that plays a beautiful chime tune when pulled. FPT4057 - Round white metal chime roller with 2 large plastic light blue wheels on the ends. The chime has pictures around it of the nursery rhyme, "Ride A Cockhorse to Banbury Cross". The chime is pulled by 2 wooden cut out ponies with paper lithographs attached to the sides. 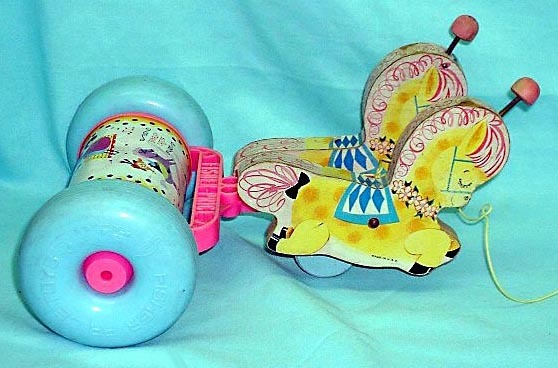 The ponies are yellow with a pink mane and tail, blue and white circus saddle, closed eyes, and a spring with a pink bead on the end on the top of their heads. When pulled, the chime chimes a song and the ponies bob opposite each other (1 is up when the other is down). Measures 13-1/2" long, 8-1/4" high, and 9-1/8" wide. Also see 1948's #758 Pony Chime. 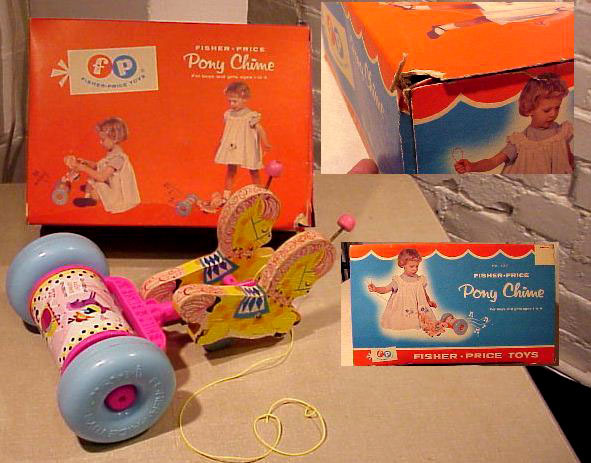 Also see 1965's #138 Pony Chime.